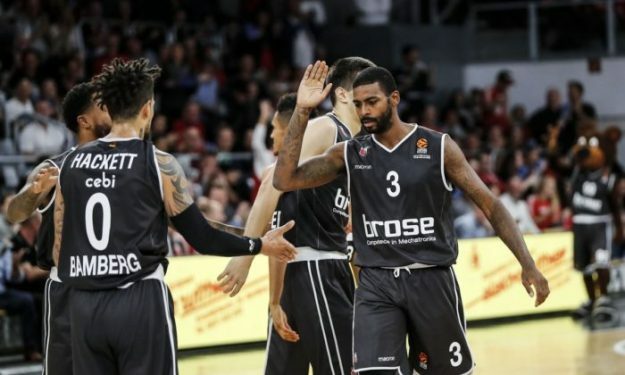 Brose Bamberg recorded a huge win in the BBL playoffs race while Bayern Munich stayed on the top with their fourth victory in a row. Five players were double-digit for Bayern Munich as they routed Rockets 102-80 on Day 30 of German BundesLeague. Despite a pretty balanced first half with Munich having a small lead (48-45), the game was decided in the third quarter which the hosts won 31-15. With this win, Bayern stayed at the top with a 27-3 record while Rockets sunk to the relegation zone with 6-23. The winning side was led by Devin Booker with 15 points while Stefan Jovic and Jared Cunningham added 14 both. Nihad Djedovic and Vladimir Lucic were also double-digit with 12 points each. On the other side, Jerome Randle scored a game-high 17 points. Earlier the same day, Brose Bamberg won 95-82 in an important match against EWE Basket Oldenburg which made them safer in the playoffs zone. They took the 6th place after this win with 19-11 record while Oldenburg fell one step behind with 18-12. Augustine Rubit led the victors with game-high 25 points while Daniel Hackett added 24 points. On the other side, Rasid Mahalbasic scored 15 points.